Functions: Print, Scan & Copy. Printable Width: Up to 203.2 inch. Paper Sizes: A4, A5, B5, 10x15 cm, 13x18 cm, Envelopes (DL, COM10), Letter, Legal. 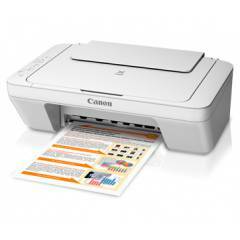 Paper Weight: Plain paper: 64 - 105 g/m² & Canon photo paper: Up to 275 g/m². Maximum Paper Input: Rear tray - Max. 60 sheets (plain paper). Selectable Resolution: 25 - 19200 dpi. Scanning Depth (Input / Output): Colour - 48 bit / 24 bit & Greyscale - 16 bit / 8 bit. Maximum Document Size: 216x297 mm. Multiple Copy (Black/Colour): 1-21 pages. It takes just 10 mins in installation , Good print quality, scanning of pages from big books is little difficult but for the money this is just perfect.